Specializing in carpet binding and custom area rug edge treatments! Kelley's Carpet & Rug Solutions is here for you! We are a local family-owned business, specializing in carpet binding and custom area rug edge treatments. We can cut any carpet to the size and shape that perfectly fits your home, boat, RV or commercial space. We are committed to providing friendly and quick service. Call or email us today! 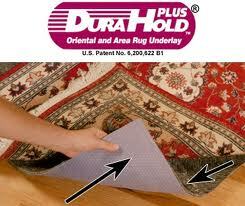 Let us custom cut a premium Durahold or Omni pad to protect your floor & keep your rugs secure!